Young kids get excited when someone new comes to the house. They like to see who's visiting - to check them out. Some kids will even ham it up, hungry for attention and determined to be center stage. Here in Doglandia, dogs are just like kids! When somebody comes into your home, he/she is entering what your dog considers her den. 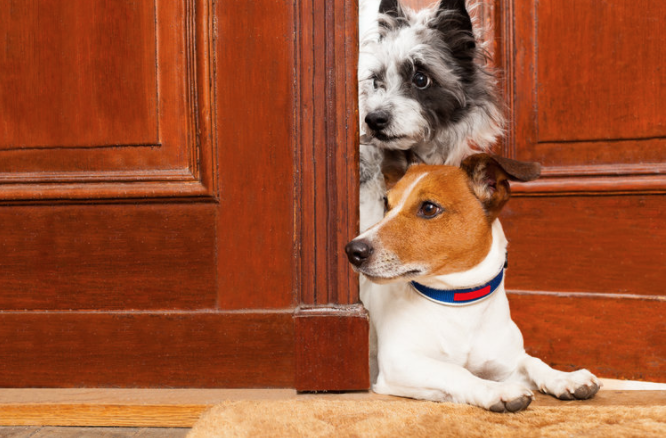 Your dog will naturally want to come and see who’s visiting. But here is where chaos can erupt. Nearsighted and odor-dependent, dogs have their unique greeting style. Unless distracted by something more fun or taught otherwise, a dog will impulsively irrupt all our human niceties to jam their nose into the visitors nether-regions or reach their paws high for a close-up, nose-to-nose look see. So where does that leave you: Can you train your dog to greet calmly? The answer is yes, and it won’t take long or cost gobs. If your only frustration is an over-enthusiastic greeting ritual, not an aggressive reaction, I can help you solve that in a Sarah-minute! 1) Choose a toy your dog loves. You can repurpose some balls, find a child’s toy that doesn’t have small breakable parts or use durable plastic bottles filled with 10 dog treats. Play with your toy until your dog can identify it by name, think ball-toy-bottle, then line them up on a nearby shelf or place them in a basket by the door. 2) Teach your dog to “Sit” for everything. Make it fun. Take a handful of breakfast and have him do a series of 10 quick sits. Have him sit for everything he wants, from a pat to a toy toss or walk. “Sit” teaches your dog what to do when he wants something. Dogs can learn to sit for greetings, instead of jump. 3) Before reality strikes, play with your dog by the door. Twist the knob, knock, ring, open and shut the door — as you do these things play with your dog's distraction toy. When he calms down, ask him to “Sit” and offer him a toy or a friendly pat. 4) Now you’re ready for a test run. First practice with family and friends. As they enter, ask that they ignore your dog until she calms down. Divert her enthusiasm with her toy. If she’s still over-the-top wild, affix a drag leash to step on until she’s a tad-less enthusiastic, then introduce the toy or activity. 5) Remember that your dog’s enthusiasm is a good thing. Your dog likes people; his over the top rituals can be redirected positively. Be patient with the process — progress depends on age and enthusiasm level. Don’t get angry or tough on your dog, and please don’t shock him with an electric collar. Your dog might learn to think that visitors equal danger, not friends. Watch the video and others like it on the WhenDogsTalk Youtube Channel for tips and suggestions. For a more in-depth look at the dog, you love like a baby, pick up a copy of Modern Dog Parenting!